Suite Belle-Jardin Sleeps 2-6 Persons. Google-map us to see for yourself. Great location within the heart of Quebec City to walk and visit. Being local, we respond to your needs promptly. Our Suites are fully furnished and have all the comforts of home! Bienvenue Chez Vous! 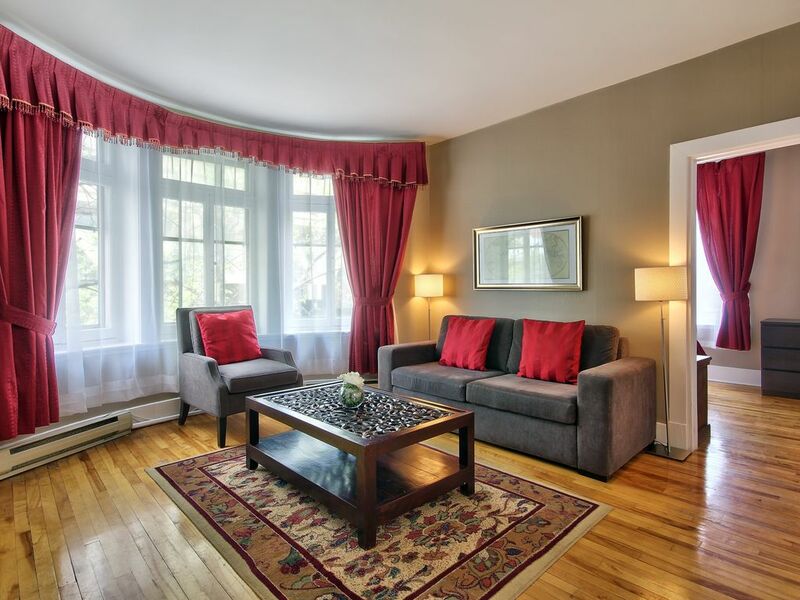 Perfect location in Old Quebec City, between Grand Allée Est a popular street boasting restaurants with patios, the Parliament, Citadelle and leading you right into the walls of the Old Cit and next to you is the beautiful and majestic Plains of Abraham, a Canadian National Park. You will be immersed in Quebec's unique cultural heritage and architectural beauty. You will love the location. Great Value for spacious, fully private apartment Suites - fully equipped kitchen, dinning and living room, linens and towels, high speed wireless internet and cable TV with music channels. Experience Quebec Heritage. Onsite parking. Next to the Plains of Abraham and Grand Allée Est. Walk along Grand Allée to the Citadelle, Parliament and into the gates of Old Quebec. Free Skiing on 102 acres of Heritage Park - Plains of Abraham, in downtown Quebec City. Just a 10 minute walk. Mount Saint Anne Ski resort is a 20 minute drive. We have a landline at the entrance of the main house for local calls. You can use our complementary WiFi internet to make calls via Skype. We can give you access to the laundry - dryer room. Parking is available on site for $15 Canadian a night. Complementary WIFI High speed wireless internet in your suite. Fully equipped kitchen with dishes, pots/pans and cutlery. Child's high chair upon request. Complementary music channels on cable TV. Upon request, we offer toys, highchair and crib. Plains of Abraham is next door where you can ski cross country. Perfect stay for up to 4 people. Easy check in with a welcome that that was full of great advice, thank you David! Quiet,convenient location, walk to everything! Great natural light, fully equipped in every way. Curtains that cut the light when sleeping, kettle for tea, WiFi, drawers, many details that other rentals often overlook. We will be back! Lovely, clean and bright in a great location. The weather in Quebec City in April was cold, yet the hospitality was very warm. The apartment was most inviting and comfortable. It looked better than the photos. The location was perfect for visiting the old City and nearby museums. Many great restaurants were right around the corner. The view from the revolving restaurant atop The Concorde hotel across the street was amazing at night. I look forward to another visit. It was exactly as promised! A perfect family getaway. Sarah was a fabulous hostess and even did our laundry 😊! We are happy you had an Amazing getaway! The pleasure was ours to receive you! Everything was perfect from Sara’s greeting and accommodating for our family dinner to the comfortable beds and well equiped kitchen. Location is great, close to everything without needed your car. We are happy you found everything perfect! The pleasure was ours to receive you and you are always welcome! Clean, cozy, well stocked suite within walking distance to everything. We took advantage of this winter wonderland with cross-country skiing, sledding and skating across the street in the beautiful park Plaines d'Abraham . So much to do and see day and night. Great restaurants, beautiful shops. Plus short drive to other not to be missed sites and activities. Great family vacation. We are happy you had a Great Family Vacation! Thank you for sharing your experience, Québec City is indeed a winter wonderland. Great location. Close to everything. Clean and Sarah was awesome. We are happy you had a Fantastic Stay! Thank you for sharing your experience and Sarah is awesome. *The Plains of Abraham and St. Lawrence River - National Canadian Park an important historical and prestigious city park. *La Citadelle / Musee du Royal 22nd Regiment / Citadel / Museum -the beginning of Old Quebec City wall. * Fountaine de Tourne (fountain) - In 1855, won gold prize at the Paris World Fair. *Les Glissades de la Terrasse / Slides in the Winter- bring your snow pants! *Centre d'interpetation de Place-Royale/ Interpretation centre. Payment and Cancellation Policy If cancelled or modified up to 60 days before the date of arrival, payment is fully refundable less $75 administration fee.